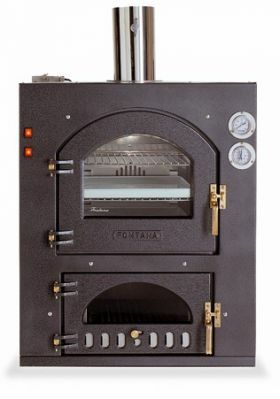 The Inc Q is the square build-in version of the GUSTO, Fontana's best selling portable wood-fired oven. Many can be found in Italy to still be in use after 30 years of service. The Inc Q is a heavy duty unit that is made of a combination of cast iron, steel, and stainless steel for years of dependable use. They are extremely practical and easy to use - equipped with an interior light and a convection fan. This square fitted oven makes external tiling very simple. It is perfect for any environments, respecting the finest gastronomic tradition. INC 100Q - Depth 40", Width 20", Height 18"
INC 100Q - Depth 46", Width 33", Height 36"
Such an internal configuration allows an equal amount of heat distribution inside the oven and prevents the formation of areas with different temperatures, which might prevent a homogeneous baking. The main body of the oven consisting of the combustion area and the cooking area, is covered in a layer of iron wool of an average depth of 80 mm.